If you walked down the Infinite Corridor at any point this fall, you may have noticed that the typically bustling undergraduate Admissions Office was unusually quiet. Each fall, as our OVC colleagues welcome new and returning students to campus, MIT undergraduate admissions officers hit the road to replenish our ranks. This year, 16 admissions officers traveled to 54 cities throughout the United States (and nine cities in Africa) searching for the brightest, most diverse, and best-matched students for an MIT education. Each trip consists of two to four evening information sessions per region that draw anywhere from 80 people in Portland, Maine, to nearly 800 people in San Jose, California. In total, we met with over 5,000 students, their parents, and college counselors. While we don’t visit every state every year, we do rotate states and cities over a three-year cycle, ensuring we don’t miss anyone during their high school years. 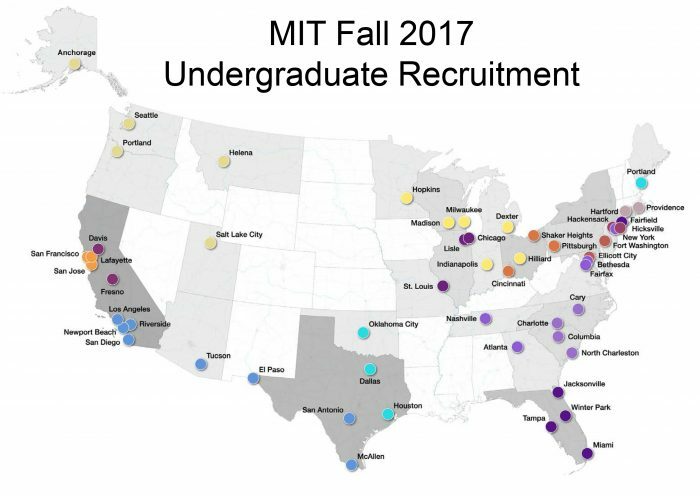 Our recruitment goals are to highlight the incredible opportunity of an MIT education, particularly for students and families who haven’t been able to visit our campus for geographic, financial, or other reasons. The days are filled with short, less formal visits to high schools in the region, with a special focus on reaching public and under-resourced schools. Many admissions officers visited community-based organizations that offer college counseling to underserved high school students. In addition to meeting prospective students and counselors, the nationwide travel allows admissions officers to connect with our incredible alumni interviewers (educational counselors), who provide local context for each applicant and geographic region. By mid-October, with hundreds of thousands of miles traveled, staff had returned to the office excited about having met many of this year’s applicants. We are now ready to begin again the process of application review for the 2022s! Undergraduate admissions officers visited 54 cities this fall.